In order to keep up the spirits of the colonists of Port Royal during the winter of 1606-1607, a sort of club was organized called "The Order of Good Times". Each member had to take his turn in providing the dinner and by hunting, fishing, and trading with the Indians, each tried to set forth the finest meal. 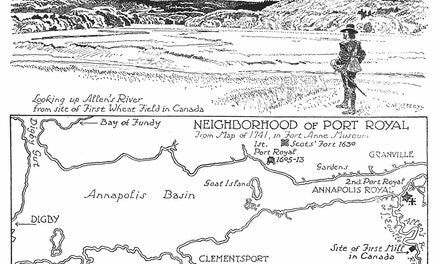 As a result they feasted sumptuously on wild fowl, venison, bear's meat, moose, and freshly-caught fish, as well as corn, pumpkins, and other produce from their gardens. The company marched into the dining-hall bearing the various dishes, and led by the master of the feast for the day, who wore round his neck the badge or chain of the Order, carried a large napkin over his shoulder, and held his staff of office in his hand. 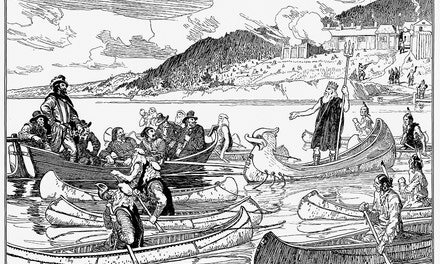 An old chief, Membertou, who had a straggling beard, and other friendly Indians frequently were their guests. The costumes show considerable variety. It was a time when fashions were changing. Some of the figures still retain the older style of wide, short, padded trunk-hose and skin tights on their legs. Others wear knee breeches tied with knots of ribbon at the knees, a more up-to-date fashion. Many imitated the king of France of that period, Henri IV, who wore a wide square-cut beard, called a spade-beard, and brushed his bushy hair up straight, while some let their hair grow in long curls over their shoulders and wore moustaches and a pointed chin whisker, which became the style throughout the first half of the 17th century. No authentic portraits are known to exist of any of the company, which included Poutrincourt, Lescarbot, Hebert, the apothecary from Paris, who was later the first farmer in Canada, and Champlain, who founded Quebec. The costumes in the picture show considerable variety. It was a time when fashions were changing. Some of the figures still retain the older style of wide, short, padded trunk-hose and skin tights on their legs. Others wear knee breeches tied with knots of ribbon a the knees, a more up-to-date fashion. Many imitated the King of France of that period, Henri IV, who wore a wide square-cut beard, called a spade-beard, and brushed his bushy hair up straight, while some let their hair grow in long curls over their shoulders, and wore moustaches and a pointed chin whisker, which became the style throughout the first half of the seventeenth century. No authentic portrait of any of the company is known to exist. The principal persons of the colony sat, fifteen in number, at Poutrincourt's table, which, by an ingenious device of Champlain, was always well furnished. He formed the fifteen into a new order, christened "L'Ordre de Bon-Temps." Each was Grand Master in turn, holding office for one day. It was his function to cater for the company; and, as it became a point of honor to fill the post with credit, the prospective Grand Master was usually busy, for several days before coming to his dignity, in hunting, fishing, or bartering provisions with the Indians. Thus did Poutrincourt's table groan beneath all the luxuries of the winter forest,—flesh of moose, caribou, and deer, beaver, otter, and hare, bears and wild-cats; with ducks, geese, grouse, and plover; sturgeon, too, and trout, and fish innumerable, speared through the ice of the Equille, or drawn from the depths of the neighboring bay. "And," says Lescarbot, in closing his bill of fare, "whatever our gourmands at home may think, we found as good cheer at Port Royal as they at their Rue aux Ours in Paris, and that, too, at a cheaper rate." For the preparation of this manifold provision, the Grand Master was also answerable; since, during his day of office, he was autocrat of the kitchen. Nor did this bounteous repast lack a solemn and befitting ceremonial. When the hour had struck, after the manner of our fathers they dined at noon, the Grand Master entered the hall, a napkin on his shoulder, his staff of office in his hand, and the collar of the Order—valued by Lescarbot at four crowns—about his neck. The brotherhood followed, each bearing a dish. 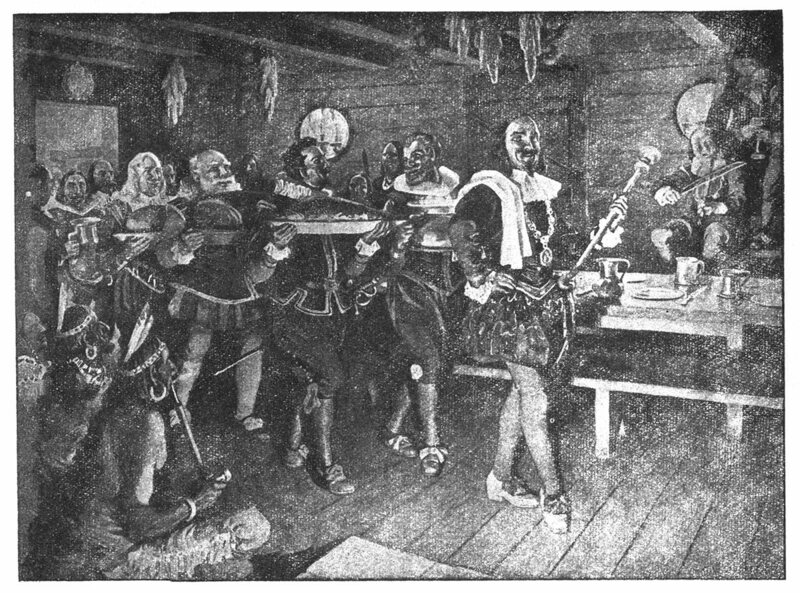 The invited guests were Indian chiefs, of whom old Memberton was daily present, seated at table with the French, who took pleasure in this red-skin companionship. Those of humbler degree, warriors, squaws, and children, sat on the floor, or crouched together in the corners of the hall, eagerly waiting their portion of biscuit or of bread, a novel and much coveted luxury. Being always treated with kindness, they became fond of the French, who often followed them on their moose-hunts, and shared their winter bivouac. 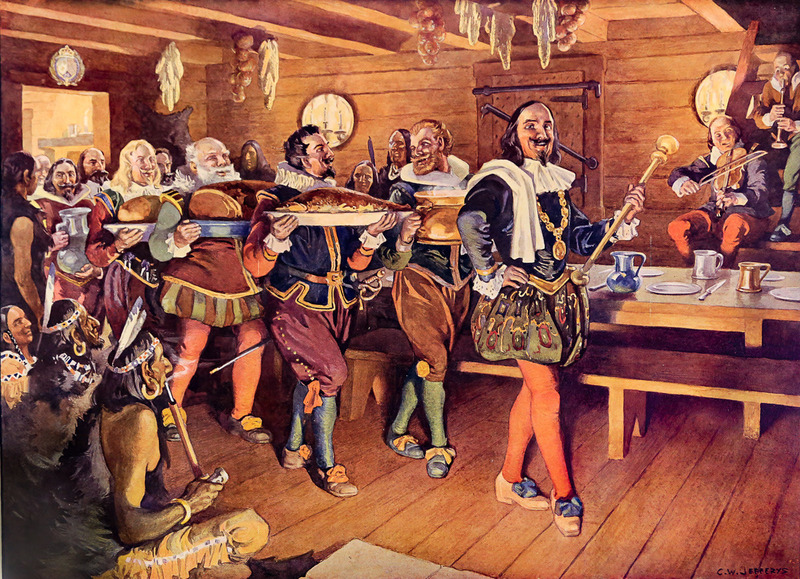 At the evening meal there was less of form and circumstance; and when the winter night closed in, when the flame crackled and the sparks streamed up the wide-throated chimney, and the founders of New France with their tawny allies were gathered around the blaze, then did the Grand Master resign the collar and the staff to the successor of his honors, and, with jovial courtesy, pledge him in a cup of wine. Thus these ingenious Frenchmen beguiled the winter of their exile. Fortier, L.M. Champlain’s Order of Good Cheer, And Some Brief Notes Relating to Its Founder. Toronto, Thomas Nelson and Sons, 1928. 28 p. Illus. 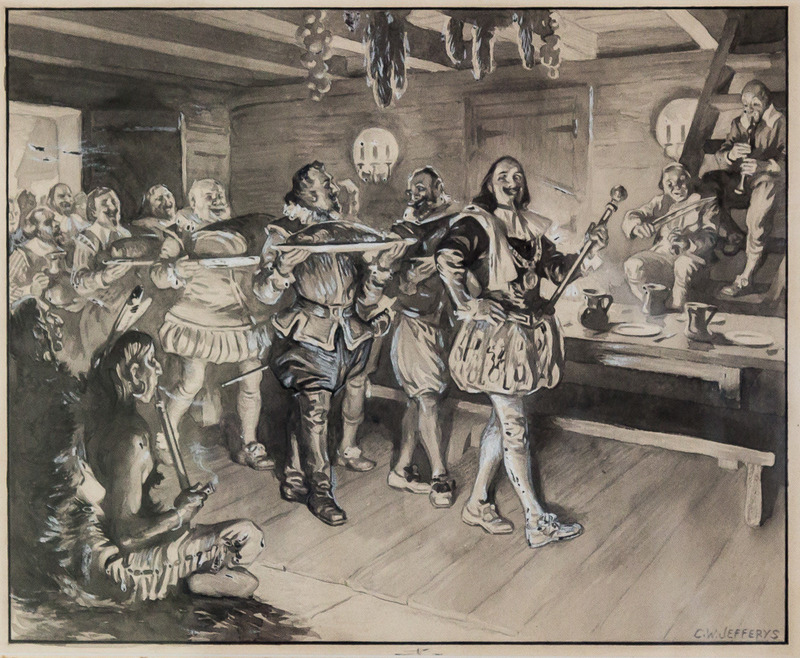 Frontispiece - “The Order of Good Cheer, Port Royal, 1606-7"
Gutzman, W. The Canadian Picture Post Card Catalogue, 1988. Toronto, Unitrade Press, 1987. 76 p. Illus. Wikipedia article "Order of Good Cheer"
“PORT-ROYAL - Champlain’s Dream.” Accessed February 8, 2017. http://erenow.com/biographies/theeuropeanfoundingofnorthamerica/11.html.